These two pieces are a summation of what is wrong with the Otterpool Consultation process. At root the biggest unanswered issue is why is this being proposed. If it is because of an “objective assessment” of housing need then publish that in a form that is comprehensible to everyone in Shepway. And explain at the same time why these numbers have increased so dramatically compared to the numbers that have been presented with the same confidence over the past fifteen to twenty years of District-wide masterplanning. Just why should we swallow these new numbers? These questions were asked all through last year, and since. They are still unanswered. Read on for some indication of the attitude of the leading protagonists. This statement is copied from the Otterpool Park website, buried deep, as a precursor to the public enragement meetings today, tomorrow and Saturday. ” 500 people attended the first engagement sessions last year, sharing their views and concerns about Otterpool Park. Andy Jarratt, Head of Strategic Development Projects at Shepway district Council was interviewed on Radio Kent, broadcast 15 June 2017. Do you think your council tax is being spent on worthwhile and essential services: Ones’ that you feel you’ve have had a say in. Ones’ that have followed the path of democracy? Think again. Our friends at Shepwayvox have highlighted 4 payments to the proposed New Town Master planner’s, Arcadis. WOW – WHAT A CUNNING STUNT. Well, she pulled it off. 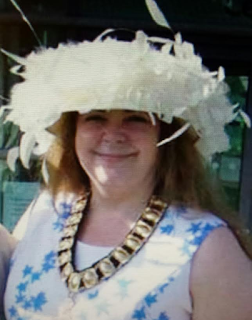 Going on the old adage that you can fool some of the people, some of the time has most definitely worked for KCC Councillor, Susan Carey. She convinced one in five of the Elham Valley electorate to go along to the polling station and place a cross next to her name. But were they aware that Ms Carey was not, shall we say, putting the electorate totally in the picture. Did they vote for the smiling Susan that you see pictured below, stating that she would safeguard the environment, give young people the best possible start in life, campaigning for better broadband and mobile phone signals. Of course they did. They were also probably of the mindset that they had always voted Conservative so why would they want to change a habit of a lifetime when all appears so hunky dory. But hang on a minute; did they realise that there was another side to Ms Carey: one that she is actually ashamed of. Yes, ashamed of. If she wasn’t ashamed of her involvement in the urbanisation of our countryside or the fact that she voted to support the building of a lorry park, why didn’t she shout it from on high. Quite simply because it would probably have altered the voting pattern of the election and ensured that her KCC salary and expenses would be extinguished in one foul swoop. 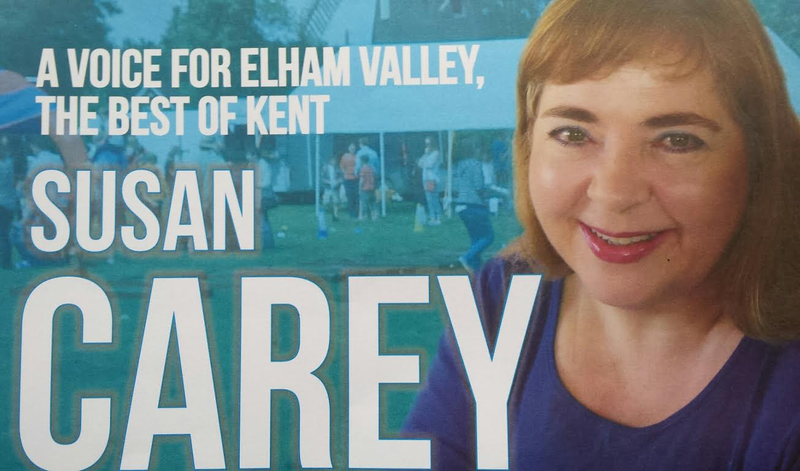 Pictured below is (also) the smiling Susan Carey that we have used on our spoof election material to keep the electorate completely in the picture. Obviously it didn’t reach 1 in 5 of the electorate that actually voted for Ms Carey, but it better reflects what Ms Carey is all about. My name is Susan Carey. I support the urbanisation of our countryside in and around Lympne, Sellindge, Newingreen, Westenhanger and Court at Street. I voted for the concreting over of 250 acres of good arable farmland to build a Lorry Park that would never actually solve the problems that Operation Stack brings to this part of Kent. I voted for and support the building of 150 homes and a leisure centre at Princes Parade, Hythe. I fiercely rebuffed any suggestion from Councillor Mary Lawes that existing homes should be upgraded before building a New town that would bring 30% open space (as opposed to 100%) to rural communities. I, along with deputy Leader Hollingsbee, have always maintained my position (since the Lorry park and New Town announcements) regarding meeting the Shepway electorate: NO PUBLIC MEETINGS WHATSOEVER. If you would like to talk with me and Jenny Hollingsbee, please contact me to arrange a meeting. I will only speak to individuals. There we have it. Susan Carey didn’t actually write any of that, but it more accurately reflects her position as a Councillor. So, was she dishonest or economical with the truth on her election material? Was she too ashamed to mention all of the facts above? Is she fit to hold public office? We’ll leave you to decide all of those things. So, if you happen to meet a Carey voter, ask them if they actually know what they’ve voted for. Chances are, you’ll be met with a vacant gaze and the old adage: “They’re all the same, whoever you vote for“.